You find different types of sponsored posts on the Internet. Those that are clearly labeled as such, those that have a label that is hard to find, and those that don't disclose that a post is sponsored at all even though it is. Most Internet users may agree that the first kind is just fine, as the site is not trying to hide that you are reading a sponsored post. The second type is in a gray area, it may be fine for some while others may dislike it, and the third type is definitely not okay at all and may even go against rulings in this regard. While you may be able to tell that a post is sponsored by looking at links or images used in the post, or by going through scripts loaded on the site, it is not something that many users may or even can do. The free Firefox add-on and Chrome extension AdDetector changes this by highlighting sponsored posts so that you know right away if a post is sponsored or not. You are probably wondering how it is doing it. If you check the source, you find several rules that are used for detection. If you take the New York Times website as an example: any content loaded from ad-assets.nytimes.com is flagged as being a sponsored post. Not that many but several of the most popular US-English news and gossip sites out there. According to the author's Reddit announcement post, he is open to adding new sites to the rules and considers adding a user-based reporting or flagging option to the extension to improve the discovery of new sponsored posts and the inclusion in the rules. For now, it is an interesting extension that has a lot of potential. If you happen to visit at least one of the sites supported by it regularly, you may find it useful, especially if that site is not disclosing sponsored posts at all or in a way that it is easily overlooked by people reading the article. Follow the links to download the extension for Firefox or Google Chrome. Thanks very much for this Martin. I read the NY Times online and a few months ago they actually announced to their readers that they would be having articles which they described as “Sponsored Content” but they pledged to make it apparent and not try to fool their readers. There was a huge uproar from many readers, but I still have yet to actually see anything which indicates an article is “sponsored”. I’m definitely going to give this add-on a try and see what it reveals. Do people actually fall for the sponsored articles? That is to say, even if you inadvertently click on something like “Pennsylvania residents can now save money on speeding tickets” which, may possibly be a legitimate article but will more likely be an add from an insurance company – how quickly would the duped reader realize this and move on? I guess enough people fall these types of “news stories” but I find it incredible that some people do. These, to me, are the webs’ version of infomercials and have about the same disclaimers and stealth that those do. This program, if expanded will definitely be of benefit. Are Adblock Plus and NoScript compatible with AdDetector? 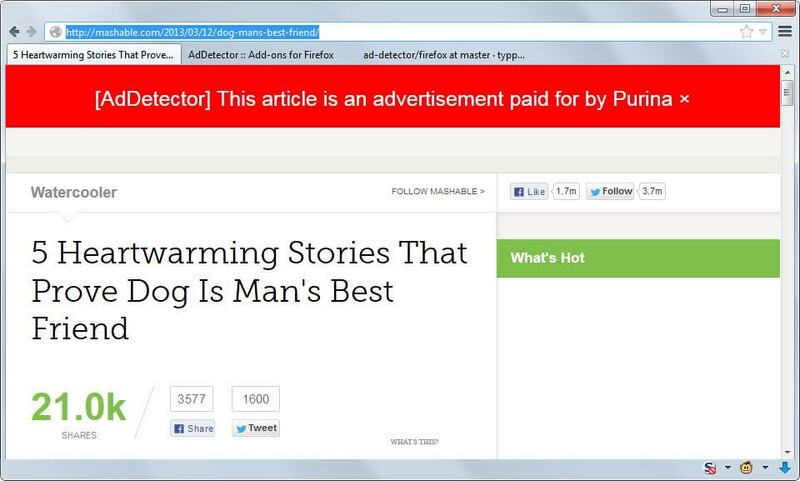 Well the problem is that the “article” you are reading is the ad, and that it won’t be blocked by an ad blocker. John Oliver had a very funny segment about this a few weeks ago. They call it “Native advertising”. Good to see that someone made an addon for it.